Storefront Fabrication & Curtain Curtain Wall Services | Commercial Architectural Products, Inc.
We have the ability to fabricate nearly any size project depending on system type and glazing requirements. We work closely with our customers to ensure we can meet and exceed production schedules. Why CAP Glazing Systems for your fabrication needs? Cut material per cut list provided by client or C.A.P. Fabricate storefront frames assembled per approved shop drawings and manufacturers fabrication manual. Mark storefront frames according to drawings. Fabricate curtain wall frames assembled per approved shop drawings and manufacturer fabrication manual. Mark curtain wall frames according to drawings. (Storefront) Butter joints and screw storefront frames together. Install endams at intermediate horizontals and seal. Insert gasket in one side of frames and leave long. Mark frames per customer schedule. (Curtain wall) Attach shear blocks to curtain wall vertical mullions. Weep pressure plates as required. Packaged per agreed upon loading sequence that will resist damage. CAP Glazing Systems uses a QA / QC Checklist, along with disgnated quality control personal whose sole responsibility is to ensure that all aspects of the required fabrication design are implemented. In this fast paced industry you can’t afford “fly-by” or “hit and miss” quality control. This is why CAP Glazing Systems is your first choice! 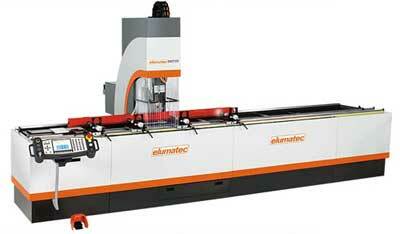 4-axis CNC machining centre with moving gantry structure. Designed for drilling, milling, thread cutting and cutting at angle any from 0° to 180° on bars or workpieces of aluminium, PVC, light alloys in general and steel. 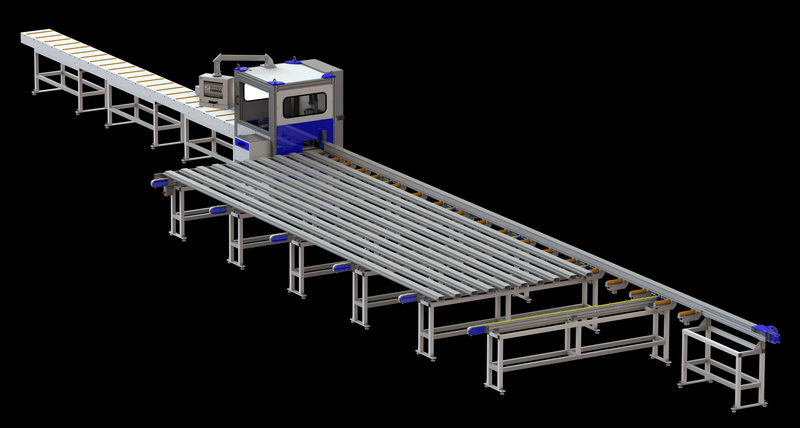 The moving part of the machine consists of a gantry with precision rack and pinion drive. 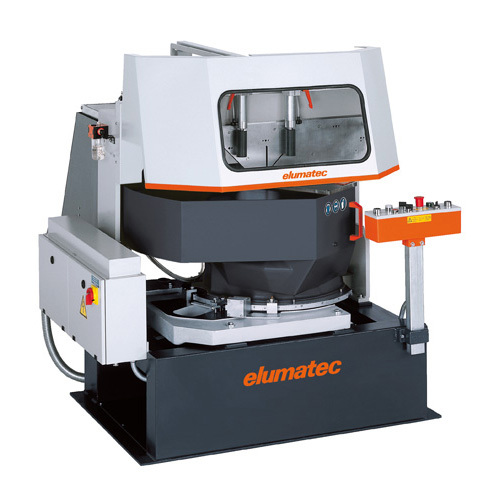 The high power 7,5 kW electrically-driven spindle with HSK-63F tool holder allows machining operations, including heavy-duty work, with optimum results in terms of speed and accuracy. A 9-place tool magazine is installed behind the moving gantry structure. The machine can be used in double mode so as to minimize machine downtime, as it is possible to change the workpiece (load/unload) and the automatic setting of the vices in “concealed” time. It is also possible to load and consequently machine different workpieces and to perform different machining operations between the two work areas. The gantry is provided with a guard which, besides protecting the operator, also reduces the noise impact on the environment. The RhinoFAB 900 Machining Center takes storefront and curtain wall material and pushes it through a fabrication center where it can drill or rout from the top, bottom and front to create fabrication holes and shapes and then a 90 degree upcut saw to trim or cut the product to the required size. Once a part has completed the fabrication cycle,The RhinoFAB 900 takes direct feed from the PartnerPak and Glazier Studio line of estimating and fabrication software. The MGS Mitre Saw is the reliable elumatec principle "Sawing from below": Free access to the table surface for optimal loading and unloading of profiles. The patented saw arm suspension creates a cutting pressure towards the back fence which ensures safe clamping of the workpiece. Safety hood opens automatically. Pulsed coolant system. Standard equipped with saw blade. Pivoting range of 22.5° to the left and right manually with digital angle display. Tilting range pneumatic 90° - 45° (intermediate angles by means of turret stop and digital display). Please contact our estimating department to get started on your next fabrication project.